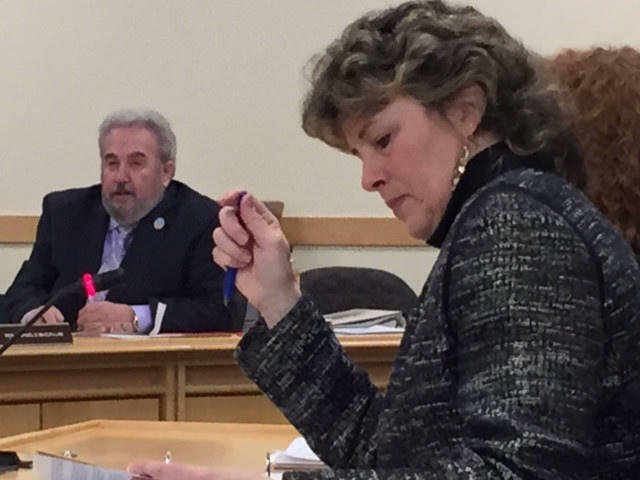 Sen. Stan Gerzofsky presses for a review of the Northern New England Passenger Rail Authority, as Beth Ashcroft, executive director of the Office of Program Evaluation and Government Accountability, takes notes. Sen. Stan Gerzofsky, a Brunswick Democrat, says he's not convinced the authority is doing anything wrong. Instead, he says he just wants to make sure the agency is being properly managed. Sen. Gerzofsky says he's fielded more than his share of complaints about Amtrak Downeaster operations in his hometown of Brunswick. The Democratic lawmaker has tried to discuss the company's plans for a new maintenance facility, idling trains, ridership and late arrivals and departures. But what really set Gerzofsky off recently was an attempt to obtain some financial data from the Northern New England Passenger Rail Authority - also known as NNEPRA -that oversees Amtrak's Maine-to-Boston service. Instead of an answer, Gerzofsky said he was invited to submit his question under the state's Freedom of Access Act law. "Even I, as a senator, can't ask a question without being told by the executive director to request it in a FOAA," Gerzofsky said. NNEPRA says it was just following protocol. But it may have been the wrong response to a veteran state lawmaker who happens to sit on the non-partisan Government Oversight Committee that has the power to dispatch its team of auditors to crunch the numbers on the accounts of quasi-state agencies and state programs. The Office of Program Evaluation and Government Accountability has undertaken similar investigations of the Maine State Housing Authority and the Maine Turnpike Authority. Gerzofsky says he's not as concerned about NNEPRA doing anything wrong; he just wants to make sure they're doing things right. "This request is really about transparency as much as anything," he says, "and I've just run out of ways of trying over the last four years." Most of Gerzofsky's fellow panelists on the GOC empathized with the lawmaker's frustrations, particularly after learning that even the Legislature's Transportation Committee had not scrutinized the authority's operations in recent years. And now there is also talk of extending passenger rail service to destinations such as Augusta, Lewiston and Bangor. 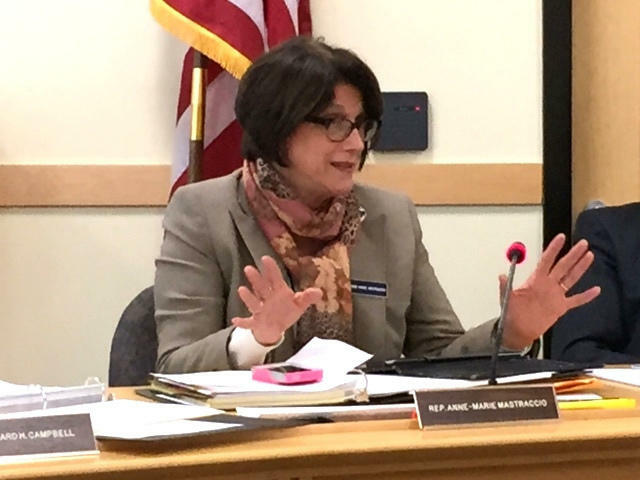 Rep. Anne-Marie Mastraccio, a member of the Government Oversight Committee, seeks guidance on what role Sen. Gerzofsky would play on the committee during any review of the Northern New England Passenger Rail Authority. Sen. Chris Johnson, a Somerville Democrat, is among those who favor a review. "I think we expect boards in our quasi-governmental agencies to be transparent and inclusive." But committee member Rep. Anne-Marie Mastraccio, a Sanford Democrat, wondered whether Gerzofsky might be too close to the issue. She worries that could influence the process. "I'm really concerned about remaining objective as a committee and doing things properly," Mastraccio said. Beth Ashcroft, executive director at OPEGA, said the GOC had a number of options, ranging from assigning top priority to a NNEPRA audit to simply placing the agency on OPEGA'S work plan for a preliminary review. "That would be telling us to do preliminary research and then coming back, so even with that option you do get another option to say we're going to go further or we're not," Ashcroft said. "We've been watching," said Wayne Davis, chairman of TrainRiders Northeast, an advocacy group that promotes expanded passenger rail service in Maine. "Probably it's one of the most efficient state operations in Maine - we're lucky to have it." Davis says he is skeptical about Gerzofsky's motivations in calling for the audit, and says he was told that Gerzofsky was out to get NNEPRA Executive Director Patricia Quinn. "You have people involved who are quite public about saying, 'I'm going to take that woman down,' " Davis said. "I mean, that's pretty powerful stuff." Gerzofsky denies ever having made such a threat. "I don't know whoever said that - I've never said that. That's totally inaccurate. I've never thought that. I can't control what Mr. Davis has to say." NNEPRA executive director Patricia Quinn did not return calls to MPBN by air time. But the Portland Press Herald quoted her as saying the authority welcomed the review and had nothing to hide. The oversight committee will determine whether a full audit of the authority is needed later in the year.